A. Introduction by Judy Chicago: Judy Chicago explains her motivation and experience for this curriculum. B. Welcome by Constance Bumgarner Gee: A welcome by Through the Flower’s Education Committee Chair. C. The Evolution of the Curriculum: By Marilyn Stewart, Kutztown University explains the theory and practice behind the curriculum. D. The Curriculum Team: Provides a short biography on each of the members who volunteered their time in creating the curriculum. A. Principles for Teaching: These principles guide teachers to engage students in exploration of artworks. B. An Invitation to Discovery: Explains the organization of the curriculum and the key ideas used throughout. C. Fourteen Encounters with Classroom Connections: The Fourteen Encounters comprise the curriculum and provide a framework for teachers on how to teach The Dinner Party in their classroom. The Classroom Connections are examples of various projects done by teachers using the Encounters. D. Building on The Dinner Party: Teacher Hannah Koch built an entire classroom curriculum based upon the Susan B. Anthony place setting, thereby demonstrating the educational potential of The Dinner Party. The Classroom Connections that follow some of the Encounters include lesson plans and projects for different grade levels by some of the teachers from around the country who attended the first Dinner Party Teacher’s Institute. Our intention is that most of the Encounters can be adapted to whatever grade you happen to teach, and the Classroom Connections are examples of how some teachers approached the material for their particular classrooms. 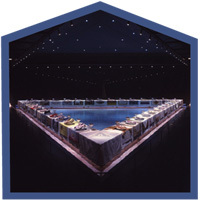 The Building on The Dinner Party by Hannah Koch is an example of how The Dinner Party can be a catalyst for developing a lesson and how the curriculum framework can be adapted by teachers in their classroom. The lessons found in the classroom connections are what we mean by using the Encounters to create and adapt lessons for their respective classrooms.